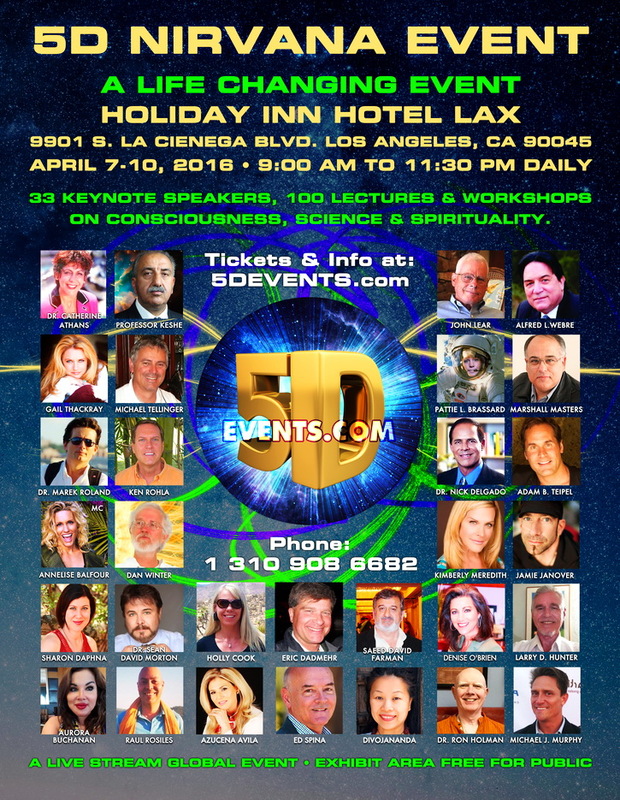 5D NIRVANA EVENT is a celebration and life transformation by a crowd of amazing people. This event has over 33 keynote speakers giving hundreds of amazing lectures, panels, workshops and exhibits in a wide variety of subjects such as: Consciousness, Science, Cutting edge Technologies, Spirituality, Latest Health Discoveries, Energy Healing, Longevity, Free Energy, Alchemy, GMO, Agenda 21, Space, Time Travel, Artificial Intelligence, Subconscious Mind, Geoengineering, Ecology, Eugenics, ET Disclosure, Cosmic Cultures, Secret Space, Paranormal, Metaphysics, DNA Activation, Secrets of Pyramids, Human origins, Crop circles, Path of Enlightenment, Conscious Leadership, Conscious Commerce, Business Networking, Self-Development, Empowerment, Nirvana, Personal Growth, Soul Cleansing, Karma cleaning, Self-Confidence, Vitality, Joy, Life Satisfaction, Evolution, Thriving, Awakening, Mastery, Meditation, Music, and Building a new and better future with Star Seeds, Indigo and the New Humanity Team. A LIFE CHANGING EVENT BE THERE! 5D NIRVANA EVENT is a celebration and life transformation by a crowd of amazing people. This event has over 33 keynote speakers giving hundreds of amazing lectures, panels, workshops and exhibits in a wide variety of subjects such as: Consciousness, Science, Cutting edge Technologies, Spirituality, Latest Health discoveries, Energy Healing, Longevity, Free Energy, Alchemy, GMO, Agenda 21, Space, Time Travel, Artificial Intelligence, Subconscious Mind, Geoengineering, Ecology, Eugenics, ET Disclosure, Cosmic Cultures, Secret Space, Paranormal, Metaphysics, DNA Activation, Secrets of Pyramids, Human origins, Crop circles, Path of Enlightenment, Conscious Leadership, Conscious Commerce, Business Networking, Self-Development, Empowerment, Nirvana, Personal Growth, Soul Cleansing, Karma cleaning, Self-Confidence, Vitality, Joy, Life Satisfaction, Evolution, Thriving, Awakening, Mastery, Meditation, Music, Building a new and better future with Star Seeds, Indigo and the New Humanity Team. The global live stream is available as a pay per view event. 9901 South La Cienega Blvd. New Humanity Movement consists of a global group of awakened, humanitarian, peace-loving humans who believe in a new Earth with common goals for a totally different future outcome. Our movement is currently rewriting a new future in a positive direction for mankind by bringing forward new ideas and ways for living in harmony and peace with a universal code of ethics and standards.